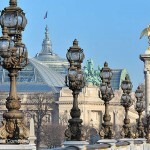 The Grand Palais (Great Palace) was built in 1897 for the 1900 Worlds Fair Exposition. Built on fill and lacking maintenance the building was in such disrepair that it had to be closed to the public in 1993. Therefore, extensive repairs, restoration and replacement took place from 2001 until 2007. Saint Astier® Natural Hydraulic Limes were specified for the entire masonry part of this gigantic undertaking.